Gemballa Racing and their McLaren MP4-12C GT3 will make its official racing debut this weekend in the German ADAC GT Masters Series. GTspirit will be visiting the ADAC GT Masters event on Sunday to share with you the latest from race. 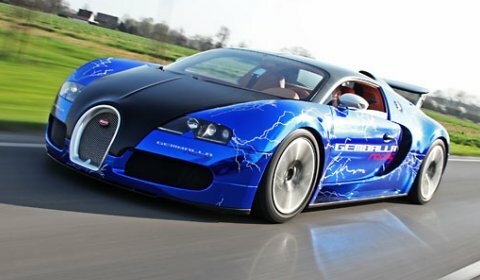 To celebrate the debut, Gemballa Racing dressed a Bugatti Veyron Sang Noir in an unique wrap combining a Gemballa blue color trim, glow-in-the-dark lightning flashes, and brand logos with the known characteristics of one of the fastest cars on the planet. 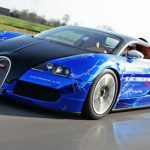 The Veyron coupe was only fitted with a wrap and serves as a promo vehicle for Gemballa Racing. Gemballa and Gemballa Racing did not tune the hypercar in any other way. The unique wrap was done by the speciaists at Cam Shaft. Quite a few supercars wrapped by Cam Shaft have been featured on our frontpage over the past months, like the Lamborghini Gallardo Koi Camouflage wrap. More projects can be found on their Facebook page.